The always-insightful consulting and research firm Noel-Levitz is out this year with two new studies that nicely add to the current research on online recruiting practices and the motivations and concerns of prospective international students. The first, 2014 E-Recruiting Practices Report for Four-Year and Two-Year Institutions, draws on a survey of 258 US colleges and universities to provide a summary of the online recruiting strategies most commonly used among US institutions. A second study, 2014 International E-Expectations Report, surveyed more than 2,400 prospective international students (from 164 countries) in order to map the major preferences, concerns, and requirements of students planning to study in the US. The two papers, while not explicitly companions of one another, nevertheless make interesting reading when placed side by side. They are both heavily oriented to the US market but many of the insights they provide will be useful to those recruiting or referring students outside of the US as well. Noel-Levitz asked institutional respondents to indicate which of 28 common e-recruiting practices – other than social media – that they used most frequently. The following table summarises the ten top-ranked options, broken down by type of institution. In a separate ranking of 21 social media platforms, Facebook remains the most commonly used social channel among US institutions, followed by Twitter and YouTube. If included in the overall ranking of recruiting practices above, Facebook would appear as the first or second most common online recruiting practice in each institutional category. 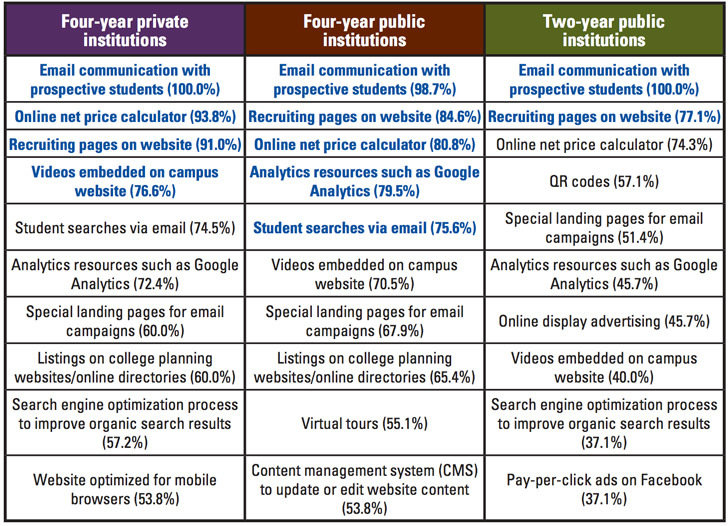 As was the case in an earlier 2012 survey, the 2014 findings point to email marketing, recruitment-oriented websites, Facebook, and online calculators as the most popular e-recruiting practices for US institutions. However, US recruiters are adopting additional practices too – notably the use of video and specialised landing pages for specific campaigns or student segments. Institutions are also making greater use of virtual tours in 2014, including those delivered via YouVisit, a fully featured virtual tour platform that is widely used by US institutions. 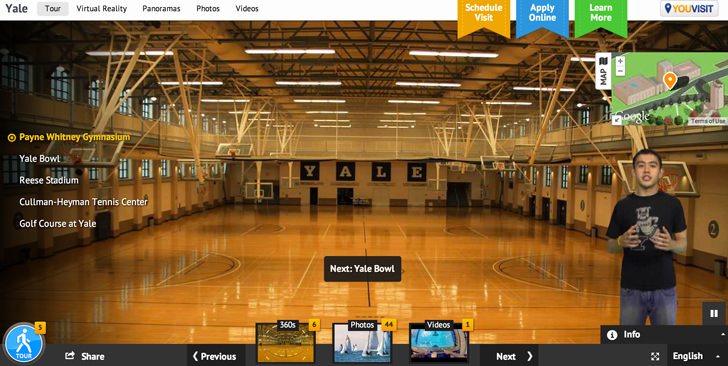 The image above is taken from a YouVisit Athletics tour of Yale University. It is also noteworthy that institutions are spending more on online than was the case even a couple of years ago. “The proportion of 2014 respondents who reported spending US$50,000 or more to maintain their admissions-related web content increased among four-year institutions compared to 2012, the last time this study was conducted,” notes the study report. In 2012, 34.5% of four-year private, 38.7% of four-year public, and 6.9% of two-year public institutions reported having a mobile website. These numbers are up substantially in the 2014 survey: 53.8% for four-year private, 47.4% for four-year public, and 22.9% for two-year public institutions. However, when compared against student behaviour and preferences, it is clear that institutional websites are still lagging in this respect. As many as 71% of US college-bound high school seniors report having looked at college websites on a mobile phone or tablet. This is up from 52% in 2012. The 2014 International E-Expectations Report, meanwhile, reveals that 30% of international prospects primarily access the web via a mobile device, and 60% have looked at a university website on a smartphone or tablet. These findings are in line with observations from other recent research, including a current WES study that found that mobile devices play a significant role for international prospects and where 56% of survey respondents reported that they had used a smartphone to search for and apply to a US college or university. The Noel-Levitz survey also asked institutions to indicate which of 23 possible items were included on their primary web page for prospective students – that is, either published on the page or directly linked from it. 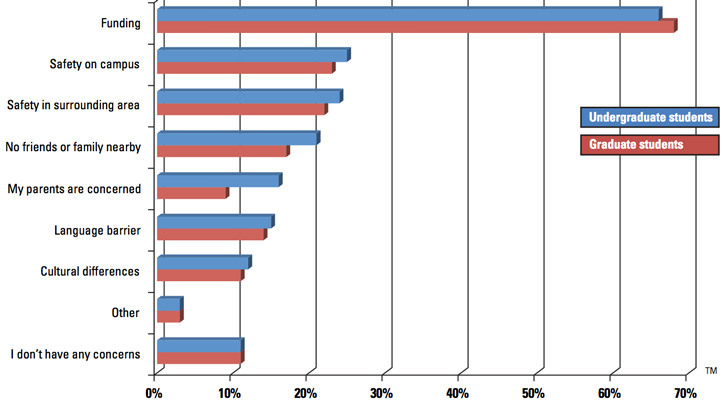 The following table shows the top 10 ranked responses, again broken down by institutional category. As the table reflects, the most commonly included elements were lists of academic programmes, admissions information, and financial aid information. Outside of this range, campus visit details figured prominently as did links to social media channels and student life information. 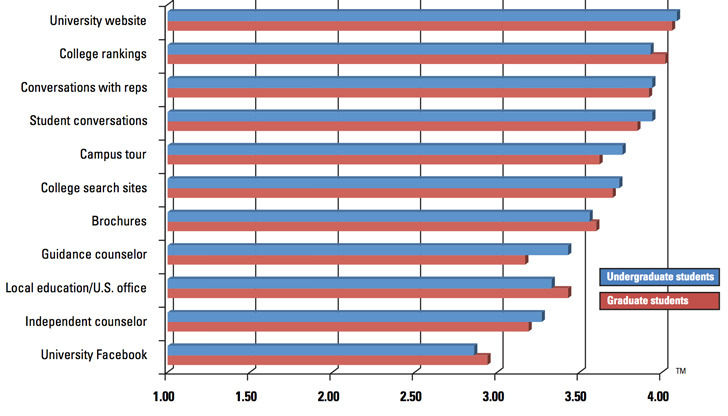 The content ranking reported by institutions matches up well with prioritised student requirements from the 2014 International E-Expectations Report, as reflected in the following table. 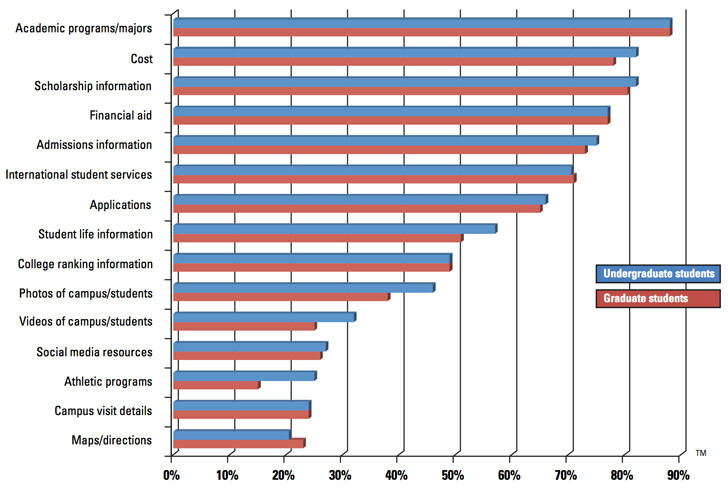 This correspondence between the most common content structures of institutional websites and the information most in demand by students becomes even more significant in light of a further Noel-Levitz finding as to how influential the institutional web experience is on a prospective student’s application decision. 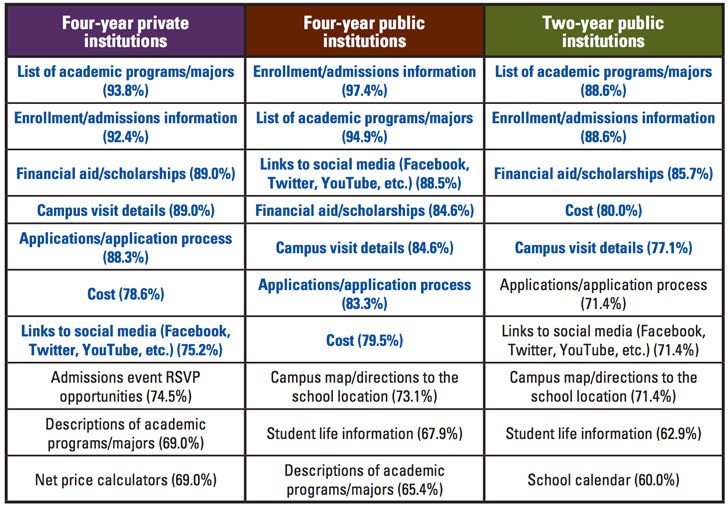 The following table ranks several factors on a five-point scale, where “5” = “most influential.” The student responses to this survey question place the university website experience as roughly equivalent to “college rankings” as the most influential factor in the application decision for both undergraduate and graduate students. Also of interest when prioritising web content for international prospects, a majority of student respondents indicated that they needed help with visa application processes, many students (41% of prospective graduate students, 30% of undergraduates) said they needed assistance in developing their English skills, and a majority (58% of undergraduates, 49% of graduates) reported that their study abroad decisions would be made jointly with their parents. These findings echo the concerns that student recruitment agents listed before studying abroad, as recently revealed in the 2014 ICEF i-graduate Agent Barometer. They also noted that concern among parents and students about financial difficulties, personal safety, and language difficulties diminished after students had arrived in their destination countries. Only 40-49% of institutional respondents – the percentages vary by institutional category – reported having a strategic plan to guide the development of their website or social media activities. This is an important finding in itself. It suggests that even though online recruiting activities are expanding, and are claiming a greater share of institutional budgets, they most often still unfold outside the context of a strategic plan. It will be interesting to track this aspect of institutional response in future surveys to see whether the strategic context of online recruitment marketing strengthens over time. This entry was posted in Higher Education, Marketing, Most Popular, North America, Regions, Research, United States and tagged safety of students overseas, colleges with international students, tertiary education overseas, community college, student recruitment.